The Olympic Games, soccer matches and other sporting events tend to highlight nationalism as fans cheer for their country’s athletes. In this case, the nationalism is intentional. Stock market investors also tend to be nationalists and focus on their country’s stock market, even though many may not realize it. There’s no harm in stock market nationalism. It even makes sense because we tend to accumulate and spend wealth in our home countries. But even if we invest 100% in the U.S., our analysis can benefit from a global perspective. Based on this chart of the Dow Jones World Stock Index, which includes stocks from dozens of countries, global stock markets are in an uptrend. The index’s recent breakout to new highs is confirmed by momentum, which is shown at the bottom of the chart. To focus on the long-term trend, the chart uses monthly data. 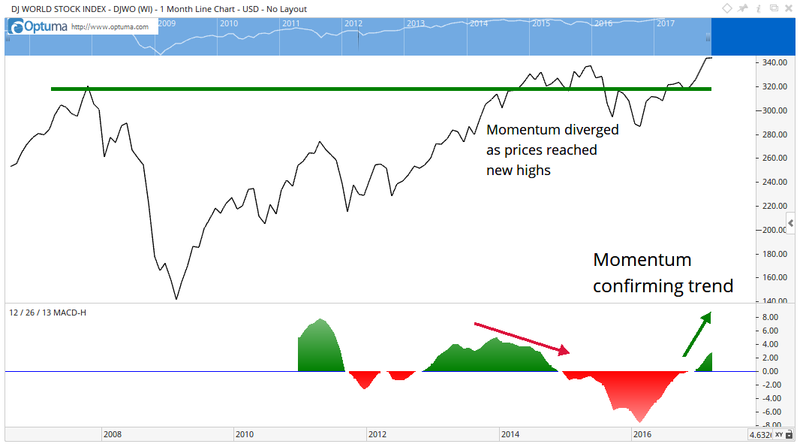 This allows us to analyze momentum since most momentum indicators, such as the popular moving average convergence divergence indicator, which is shown here, are generally only reliable on weekly or monthly charts. While these indicators are commonly applied to daily charts, there is really no evidence they work in the short term. While the chart above shows prices of global stocks are breaking out to new all-time highs and are most likely in a bull market, we also need to know whether or not the rally is broad-based. In 1999, for example, stock market indexes reached new highs, but just a few stocks were moving up. All of the gains in indexes were due to large gains in relatively few Internet stocks. As that sector climbed, other sectors were moving lower, indicating the rally was doomed. To determine how broad the participation in a rally is, we can construct a simple diffusion index. A diffusion index is commonly used by economists to determine how many components of a broad index are moving in the same direction. If more components are up than down, the index will be above 50, and economists interpret that to show economic expansion. For global stock market indexes, we can create a diffusion index by determining how many individual country indexes are in uptrends. The Wall Street Journal provides data on benchmark stock market indexes in 44 countries. Just two of those indexes (Portugal and the Philippines) are in downtrends. With 95% of the world in an uptrend, there should be little doubt that this is a bull market. Of those 44 indexes, 31, or 70%, are within 3% of a 52-week high. This is an indication the recent stock market rally is based on more than the U.S. election. Traders around the world are signaling an expectation that the global economy is primed for growth. Asia is the strongest region, with 81% of its stock markets near new highs. This is consistent with the rapid pace of growth we’ve seen in that region for decades. Even in Europe where slow economic growth has become normal, more than 70% of the region’s stock markets are within 3% of all-time highs. New all-time highs tend to make investors afraid that the good times can’t last. Successful traders need to ignore these feelings and look at the data. During the long bull market that ran from 1990 to 2000, the Dow Jones Industrial Average was within 3% of its all-time high 73.4% of the time. This is the strongest bull market in history, and investors at the time were frequently nervous that the good times would end at any moment. Investors who overcame their fear enjoyed gains of more than 400%. We are not alone. With global stock markets reaching new all-time highs, now is most likely the time for greed instead of fear. In the past, investors have usually enjoyed large rewards for buying as prices rose. This time is likely to be similar. P.S. I’m excited to announce that I’ll be holding a webinar next week. I’m finally sharing with the public a strategy I’ve been using with my own portfolio for more than 10 years that has allowed me to rack up enough profits to live the retirement of my dreams. The results, to put it mildly, have been off the charts. And the best part is, taking advantage of this strategy doesn’t require a lot of trading experience. To reserve a spot for this exclusive webinar, click here.